Smart design drives the 2017 Nissan Rogue, inside and out. Sleek, aerodynamic design characterizes the exterior, which features body-colored power side mirrors and rear spoiler, along with the sporty shark fin antenna and contrasting trim around doors and windows. The interior is just as sleek, with cloth trim (or upgraded leather, if that's your choice) and a steering wheel with enough controls to make you feel like you're flying a jet, not a Rogue. Three 12-volt outlets make traveling with devices a breeze, and the smart Divide and Hide storage system makes the potential problems of an open cargo area a thing of the past, as your most valuable purchases can be stowed in an adaptable compartment that you decide when to use. Driving and riding in the 2017 Rogue is a pleasure with its combination of on-board technology and entertainment options. 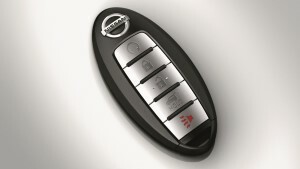 An integrated key with remote keyless entry and push button start makes the whole process easier, since there's nothing to insert. If you've got the key on you, you're on your way-no more fumbling through pockets and bags before you get started. A four-speaker stereo system, operated with an easy-to-use 5-inch color display, offers not only the standard CD/AM/FM options, but a USB jack for iPhone/iPod integration as well as Bluetooth capability. As a nice perk, a three-month SiriusXM subscription comes standard. Nissan encourages safe driving, and understands a busy lifestyle, so they've added two smart options: a Bluetooth hands-free phone system and a hands-free messaging assistant so that you can keep in touch while you keep your eyes on the road. 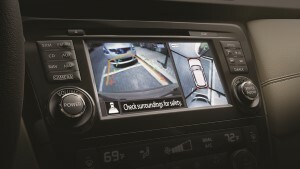 Safety is very important to Nissan, which is clear in the combination of safety features that are integrated into the 2017 Nissan Rogue. You won't be surprised by the standard safety options-advanced air bags (including knee bolsters) and a rear view monitor as well as traction control-but you can drive confidently knowing that the construction of the Rogue is focused on safety. Zone Body construction means a reinforced passenger compartment and the creation of front and rear crumple zone to help absorb the impact of any crash. Hood buckling creases and safety stop also help the Nissan Rogue to protect you in the event of a crash, something everyone wants to feel confident about in their new vehicle. Overall, the Nissan Rogue is a leader in overall value. This crossover vehicle has a base price of $24,000, but given the level of impressive and thoughtful features, that's an incredible deal. Add to those features a 26/33 mpg fuel efficiency and you have a crossover SUV that matches not only your desire for a sleek, sporty ride but also to your need for a budget-friendly efficient vehicle. The Nissan Rogue has it all. Nissan has eliminated the primary problem of an open cargo system while still offering the flexibility of that adaptable space. 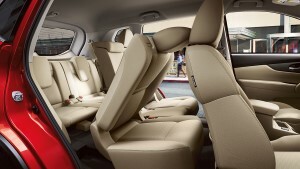 The sliding, reclining passenger seats offer more legroom and easier access to an optional third-row. With crumple zones and a reinforced passenger compartment, safety is first for the Nissan Rogue. No more keys lost at the bottom of a bag or problematic heavy keychains with this integrated key. As long as it's on you, you're on your way. It's hard to beat the 2017 Nissan Rogue, which combines sleek design and smart features with impressive safety features and an overall attention to efficiency. Visit your local Nissan dealer and take one for a test drive-we know you'll agree that the Rogue is an incredible option for people looking for both design and value.